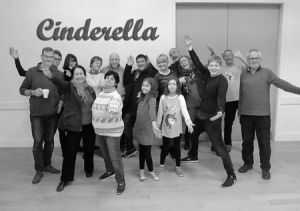 The village production of Cinderella got away to an exciting start with a preliminary meeting on Sunday 24th September. Forty people attended. They spanned the ranges of age and experience. Primary school children and experienced village dramatists watched in delight as Mike and Breda Wells played video clips of our 2006 production of ‘Jack and the Beanstalk'. That production was made memorable by the moment when the growing beanstalk collapsed. The joys of pantomime! Richard Wood was joined by a large group of ambitious actors and actresses of all ages. We can certainly cast our play. If you are keen but were not able to attend the meeting, by all means come to the reading at the village hall on Wednesday 4th October: children at 6.30pm, adults at 7.15pm. Auditions will be on Thursday 5th October, starting at 6.30pm. If you plan to come to the reading and/or the auditions you will need a script. Contact Richard Wood. Scripts will be ready shortly and will be Word documents. Print your own copy and bring it to the meetings. Cinders is not "behind you" any more. She's right up front and ready to go. Almost certainly there's a contribution for you to make. Join the fun!